Liam said: "This little bookshop is a true delight for print lovers. The books they offer are a pleasure to look at and completely different than what you can find in your ordinary bookshop. The staff is very helpful and they know their stock very well." It's possible to observe a clear pattern when you track the existence of a great bookshop back to its origins. These bookshops are very often born out of frustration. As most bookshops fail to satisfy, the disappointed bookseller-to-be decides for the last possible option - I will open my own shop. 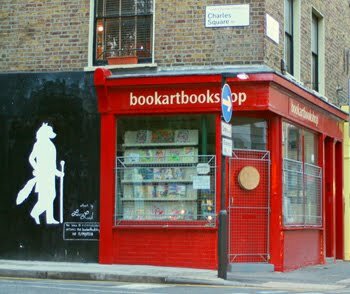 That was also the case for Tanya Peixoto, the founder of Bookartbookshop, a specialized artsy bookshop in London's East End. 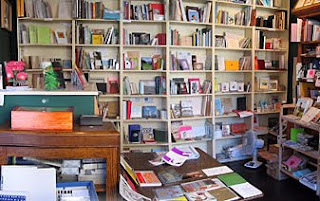 Since its opening in 2002 Bookartbookshop has been focusing on titles from artist presses. Artist's books represent a very special category in the book culture. With a history dating back about half a century, this branch still fascinates collectors and pays tribute to the traditional crafts of papermaking, illustrating, printing and bookbinding. Many of the artist presses still make books by hand, using the old traditional techniques. What makes the offer of this bookshop truly delightful is the fact that every single book on its shelves is practically a work of art. The stock is logically very strong in titles by British artist presses but it also offers space to presses from other countries. All in all, the customers can browse titles from over 300 presses. The browsing will definitely be different than what you usually experience in other bookshops. The look of the book is at least as important as its contents and originality is what counts. Most of these titles were printed in very limited editions and having all of them under one roof must be a true delight. Supporting a bookshop like this is far from an easy task and the bookshop is still partly dependent on the work of volunteers. As this sector of the bookmarket is obviously rather distanced from the mainstream, Bookartbookshop also aims to create a space where all those with a liking for the art of bookmaking could find inspiration, information and possibly likely minded friends as well. The shop is very active when it comes to all sorts of related activities such as book launches, readings, discussions and also exhibitions.